Confucius, (551-479 B.C.) Confucius was a Chinese teacher, editor, politician, and philosopher. Confucius’ thoughts and interpretation of classical texts gained the sanction of the Chinese state and his works became highly influential in Chinese government and society. Confucius was born and died in the state of Lu. He lost his father at the age of three and grew up in straightened circumstances, under his mother’s care. As a boy he liked to set up sacrificial vessels and to imitate the gestures of ritual. At the age of nineteen he married, and a son and two daughters were born to him. His relations with his wife and children were without cordiality. He was a large man of great physical strength. At nineteen he entered the service of a noble family as superintendent of parks and herds. At thirty-two he was engaged in teaching the ancient ritual to a minister’s sons. At thirty-three he went to Lo-yang, the imperial capital, to study the customs and traditions of the Chou Empire, which by then had actually split into numerous warring states of various sizes, and whose capital remained solely a religious center. On this occasion he is said to have visited Lao-tzu. When Confucius was thirty-four, the prince of Lu, threatened by powerful rivals among the local nobility, was forced to flee. 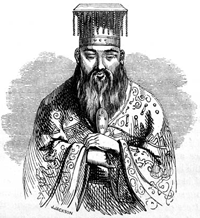 Confucius accompanied him to a neighboring state. Here he heard music, learned how to play, and became so absorbed that he forgot to eat. Returning to Lu, he devoted the next fifteen years to his studies. At the age of fifty-one he returned to political life, became minister of justice and finally prime minister of Lu. Thanks to his ability, the prince became increasingly powerful. He overcame the nobles of the region and tore down the fortifications of their cities. The land prospered. Frightened by this rise in the fortunes of Lu, a neighboring prince sent the prince of Lu a present of eighty beautiful girls trained in dancing and music and a troop of fine horses. The prince took so much pleasure in the gift that he neglected his government and ignored the counsels of Confucius. After four years of brilliant activity, Confucius gave up his position and left the country, traveling slowly, with interruptions, always in the hope of being called back. He wandered about for twelve years, from his fifty-sixth to his sixty-eighth year. He went from state to state in the hope that somewhere he would be enabled to put his political doctrine into practice. In all the years he never lost confidence in his calling as political mentor and orderer of the Empire, though occasionally he cried out: “Let me go home, let me go home.” When finally, at the age of sixty-eight, he returned to his native state, he lamented in a poem that after all his wanderings in nine provinces there was still no goal in sight for him: men are without insight, quickly the years pass. He spent his last years quietly in Lu. He accepted no government position. A profound change is said to have taken place within him. Once a hermit had said of him: “Is that not the man who knows that striving is without hope and yet goes on?” All through the years this had been Confucius’ greatness. But now he was old and strove no more. He studied the I, Ching so rich in secrets, and completed his systematic groundwork for a new mode of education by committing traditions to writing and by instructing a group of young men. One morning Confucius felt the approach of death. He walked about the courtyard, humming the words: “The great mountain must collapse, the mighty beam must break and the wise man wither like a plant.” When an alarmed pupil spoke to him, he said: “No wise ruler arises, and no one in the Empire wishes to make me his teacher. The hour of my death has come.” He lay down and eight days later he died. He was seventy-three years of age.